• New low pressure absolute ranges! 16 psia version now available! • Easy to use – No Menu. No Manual? No Problem! AMETEKCal Discounted three year calibration program. -DD Dual Line Display – Adds a second line to the display which can be set to indicate peaks, average, leak rate, or differential pressure when connected to a second pressure gauge via an ordinary DB-9 null modem cable. Great for relief valve or leak testing. When combined with the optional DataLoggerXP, the second line indicates the number of available data points. -DL DataLoggerXP – Allows you to record up to 32 000 measurements. The software application handles all of the transfer and saving of data to your computer’s hard drive, while the XP2i once authorized, performs all of the actual data collection. You can also use the software to update your gauge to the latest firmware. -F4 Panel Mounting – Includes a 4.5 inch gauge panel mount kit with a rear pressure port. To replace a 6 inch (part number 2955) or 8.5 inch (part number 2956) panel mount gauge. -RP Rear Port Fitting – The rear port fitting can be ordered separately, but is included automatically with the panel mount flange option (F4). -S2 0.02 % of full scale accuracy. See Data Sheets for complete specifications. -S5 0.05 % of full scale accuracy. See Data Sheets for complete specifications. 3193 Digital Pressure Gauge Protective Boot – 1 Generation Gauge (Black Gasket around Gauge) – A Skydrol compatible elastomeric boot to increase shock resistance. 3696 Digital Pressure Gauge Protective Boot – 2nd/3rd Generation Gauge (No Black Gasket around Gauge) – A Skydrol compatible elastomeric boot to increase shock resistance. 3456 Null Modem Adapter – A null modem for differential pressure testing between two XP2i gauges. 2955 Flange Adapter Kit – 6 inch flange adapter kit. Requires a gauge with the –F4 panel mount option. 2956 Flange Adapter Kit – 8.5 inch flange adapter kit. Requires a gauge with the –F4 panel mount option. 2984 Universal AC Power Supply – Includes a set of plugs permitting use worldwide. In the event of a power failure, and XP2i powered by the AC power supply will automatically switch to its internal batteries. 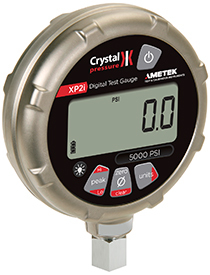 DataLoggerXP – Allows you to record up to 32 000 measurements. The software application handles all of the transfer and saving of data to your computer’s hard drive, while the XP2i once authorized, performs all of the actual data collection. You can also use the software to update your gauge to the latest firmware. ConFigXP (Free) – Allows you to customize your gauge by adding or disabling features.